There are still 2 days left to enjoy 3 day sale which is available at U.S. Aéropostale online. 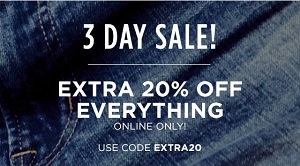 Take extra 20% off everything. Discount will be automatically applied in checkout. Offer code EXTRA20 must be entered at time of check out. For more details about the sale visit U.S. Aéropostale online.